The iOS application errors when run on a physical iOS device, iPod Touch, in debug mode. The project runs fine in the simulator in both debug/release modes and also when the application is deployed to a physical iPod Touch. A provisioning profile has been created for the iOS application. I am following the instructions, "Walkthrough: Binding an iOS Objective-C Library", on the Xamarin website https://developer.xamarin.com/guides/ios/advanced_topics/binding_objective-c/walkthrough/. 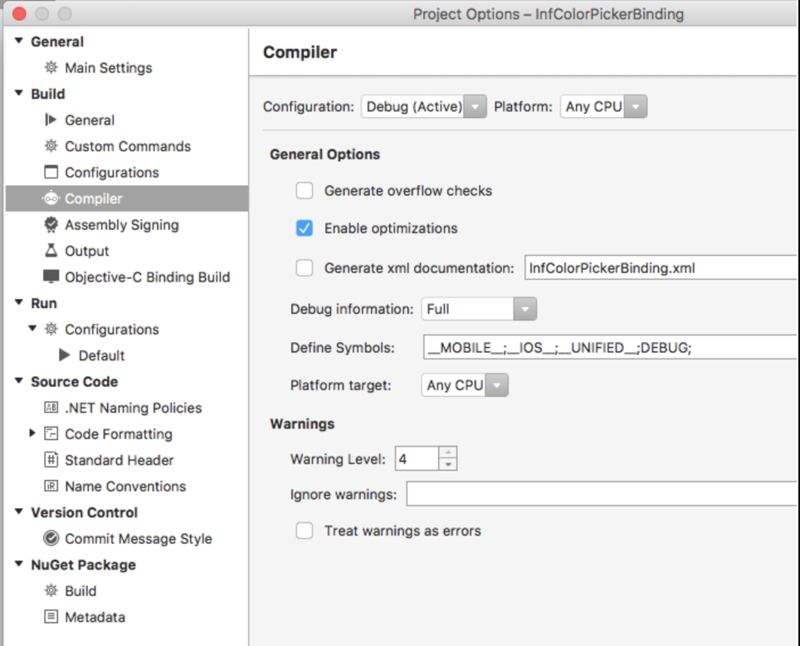 The project creates an objective-c binding library for InfColorPicker and uses the control in an iOS application. Attempting to JIT compile method 'InfColorPicker.InfColorPickerController:set_WeakDelegate (Foundation.NSObject)' while running in aot-only mode. See https://developer.xamarin.com/guides/ios/advanced_topics/limitations/ for more information. The error occurs after calling HandleTouchUpInsideWithStrongDelegate in the ViewController Class on the assignment "picker.Delegate = selector;". The exception is thrown when the InfColorPickerControllerDelegate is set in the InfColorPickerController class. Both of the classes are below. 5. Changed "Linker behavior" to "Don't Link"
The odd part is that when the example project from the xamarin webpage, https://developer.xamarin.com/samples/monotouch/InfColorPicker, it runs on the physical device without any problems. How do I resolve this problem? I've been pulling out my hair for the past week trying to resolve this problem. A setting in the IDE was causing this error to occur. To fix this problem make the following changes. In the binding project, the checkbox for "Enable Optimizations" must be enabled for the Configuration "Debug" as shown in the image below. Super! Thank you for sharing this info. Helps me a lot. Attempting to JIT compile method '########' while running in aot-only mode. See https://developer.xamarin.com/guides/ios/advanced_topics/limitations/ for more information. Ive enabled "Enable Optimizations" on all of the projects, like yo suggested, but the error persist. If any addition information is needed please share and i will post asap. @RoySadaka Did you ever figure this out ? I am also having a problem with this, did anyone ever find a solution?